The Navy Green R3 in Fort Greene includes townhouses and condominiums located directly across the street from the bustling Brooklyn Navy Yard. 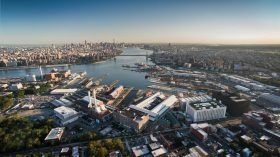 New Yorkers earning between $34,355 and $40,080 annually can apply to enter the waitlist for $947/month studios in the complex’s 45 Clermont Avenue. The eight-story building includes spacious units with high-end finishes, as well as amenities like a community room, bike storage, and large outdoor space.